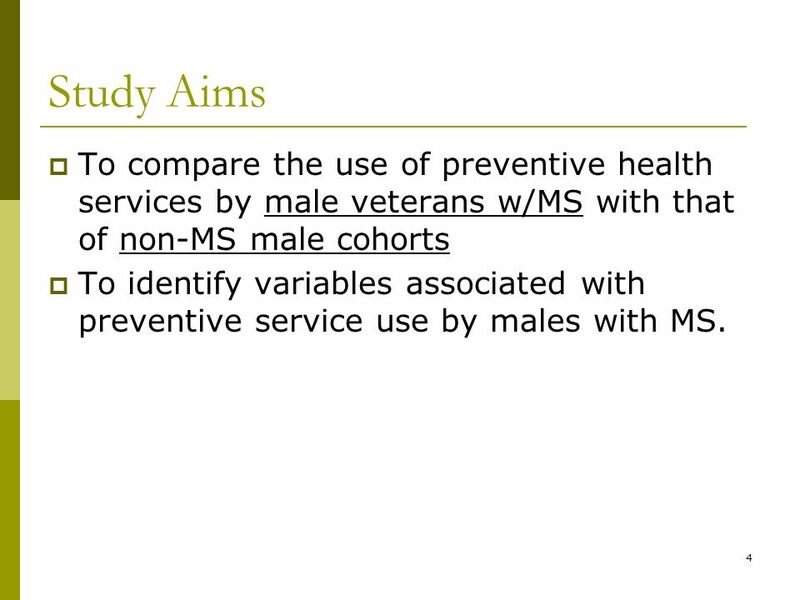 4 4 Study Aims To compare the use of preventive health services by male veterans w/MS with that of non-MS male cohorts To identify variables associated with preventive service use by males with MS.
8 8 Characteristics of Males 50 Years of Age and Older MS (n=962) General veteran c (n=25055) P value a General population c (n=21316) P value b White (%)953 92.76 24796 85.58 <0.001*21078 73.13 <0.001* Mean age (years)962 63.77 25055 66.11 <0.001*21316 60.50 <0.001* Did not graduate high school (%)957 4.49 25006 8.50 <0.001*21254 17.41 <0.001* Employed for wages (%)957 4.60 25010 27.18 <0.001*21273 42.30 <0.001* Married (%)955 77.38 25010 76.69 0.6121270 75.15 0.11 Region of residence (% South)954 28.51 25055 38.31 <0.001*21316 36.99 <0.001* Current smoker (%)955 14.03 24967 17.55 0.004*21244 18.92 <0.001* Chronic drinker (%)954 2.94 24777 4.84 0.006*21066 5.06 0.003* Mean age at diagnosis (years)932 38.36 yrs n/a Mean duration of MS (years)932 25.30 yrs n/a a P values for male veterans with MS versus males in the general veteran population. 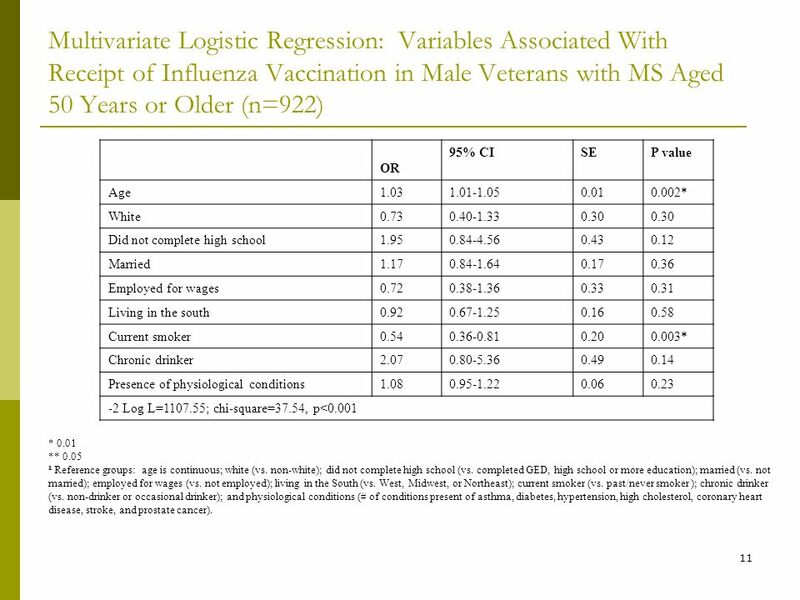 *0.01; **0.05 b P values for male veterans with MS versus males in the general population. c Frequencies and p values calculated using CDCs weighted formula. 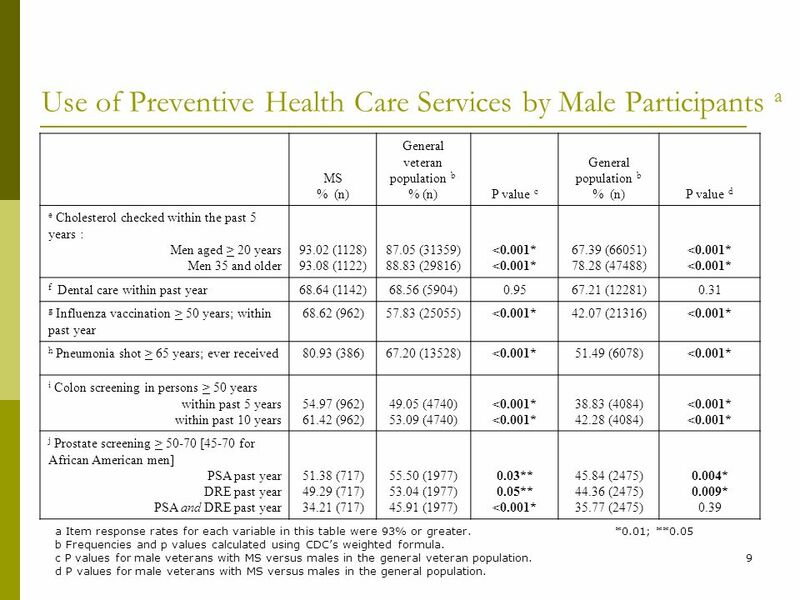 9 9 Use of Preventive Health Care Services by Male Participants a MS % (n) General veteran population b % (n)P value c General population b % (n)P value d e Cholesterol checked within the past 5 years : Men aged > 20 years Men 35 and older 93.02 (1128) 93.08 (1122) 87.05 (31359) 88.83 (29816) <0.001* 67.39 (66051) 78.28 (47488) <0.001* f Dental care within past year68.64 (1142)68.56 (5904)0.9567.21 (12281)0.31 g Influenza vaccination > 50 years; within past year 68.62 (962)57.83 (25055)<0.001*42.07 (21316)<0.001* h Pneumonia shot > 65 years; ever received80.93 (386)67.20 (13528)<0.001*51.49 (6078)<0.001* i Colon screening in persons > 50 years within past 5 years within past 10 years 54.97 (962) 61.42 (962) 49.05 (4740) 53.09 (4740) <0.001* 38.83 (4084) 42.28 (4084) <0.001* j Prostate screening > 50-70 [45-70 for African American men] PSA past year DRE past year PSA and DRE past year 51.38 (717) 49.29 (717) 34.21 (717) 55.50 (1977) 53.04 (1977) 45.91 (1977) 0.03** 0.05** <0.001* 45.84 (2475) 44.36 (2475) 35.77 (2475) 0.004* 0.009* 0.39 a Item response rates for each variable in this table were 93% or greater. *0.01; **0.05 b Frequencies and p values calculated using CDCs weighted formula. 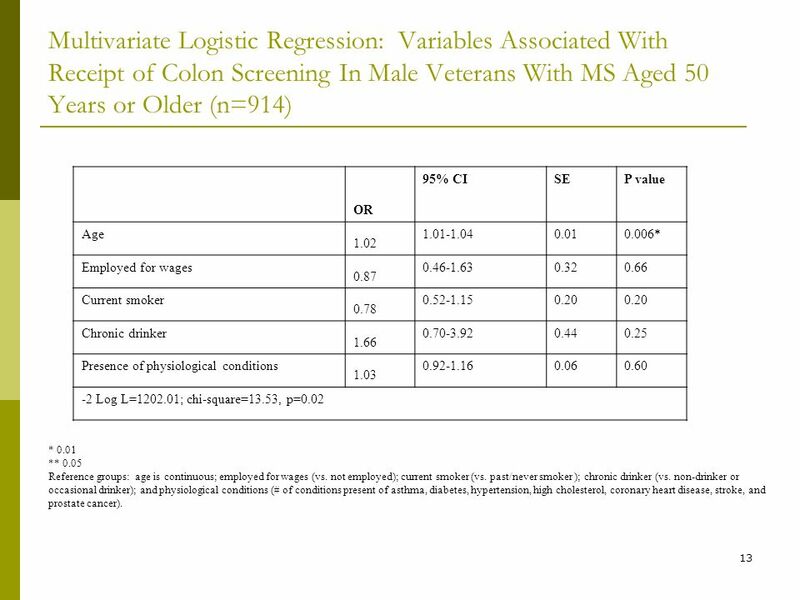 c P values for male veterans with MS versus males in the general veteran population. 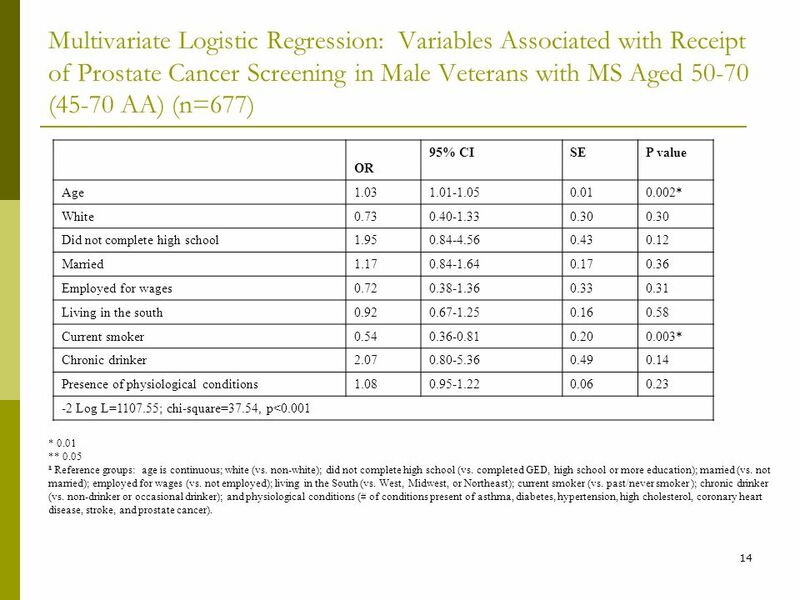 d P values for male veterans with MS versus males in the general population. 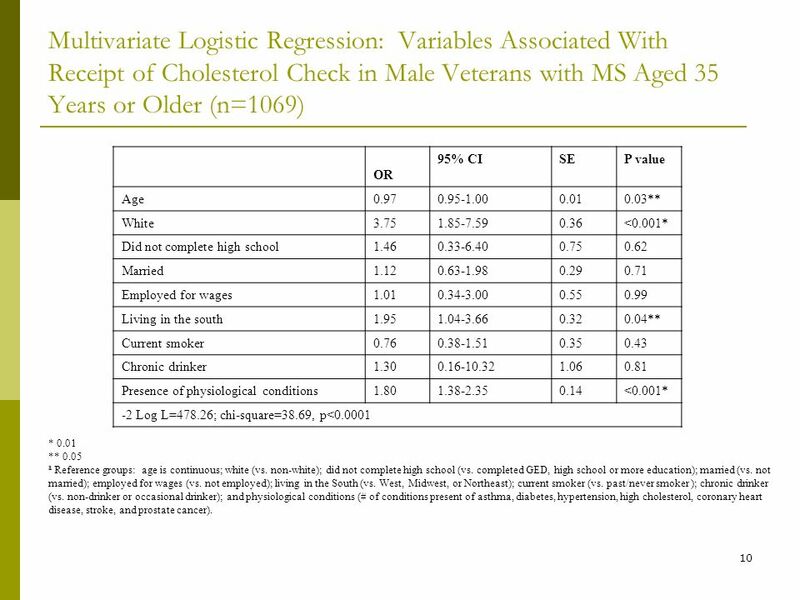 10 10 Multivariate Logistic Regression: Variables Associated With Receipt of Cholesterol Check in Male Veterans with MS Aged 35 Years or Older (n=1069) OR 95% CISEP value Age 0.97 0.95-1.000.010.03** White 3.75 1.85-7.590.36<0.001* Did not complete high school 1.46 0.33-6.400.750.62 Married 1.12 0.63-1.980.290.71 Employed for wages 1.01 0.34-3.000.550.99 Living in the south 1.95 1.04-3.660.320.04** Current smoker 0.76 0.38-1.510.350.43 Chronic drinker 1.30 0.16-10.321.060.81 Presence of physiological conditions 1.80 1.38-2.350.14<0.001* -2 Log L=478.26; chi-square=38.69, p<0.0001 * 0.01 ** 0.05 a Reference groups: age is continuous; white (vs. non-white); did not complete high school (vs. completed GED, high school or more education); married (vs. not married); employed for wages (vs. not employed); living in the South (vs. West, Midwest, or Northeast); current smoker (vs. past/never smoker ); chronic drinker (vs. non-drinker or occasional drinker); and physiological conditions (# of conditions present of asthma, diabetes, hypertension, high cholesterol, coronary heart disease, stroke, and prostate cancer). 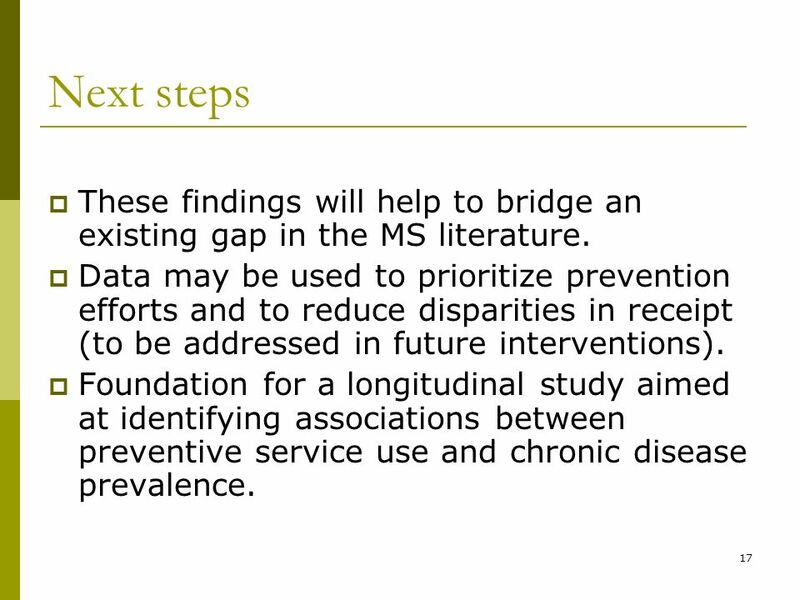 17 17 Next steps These findings will help to bridge an existing gap in the MS literature. 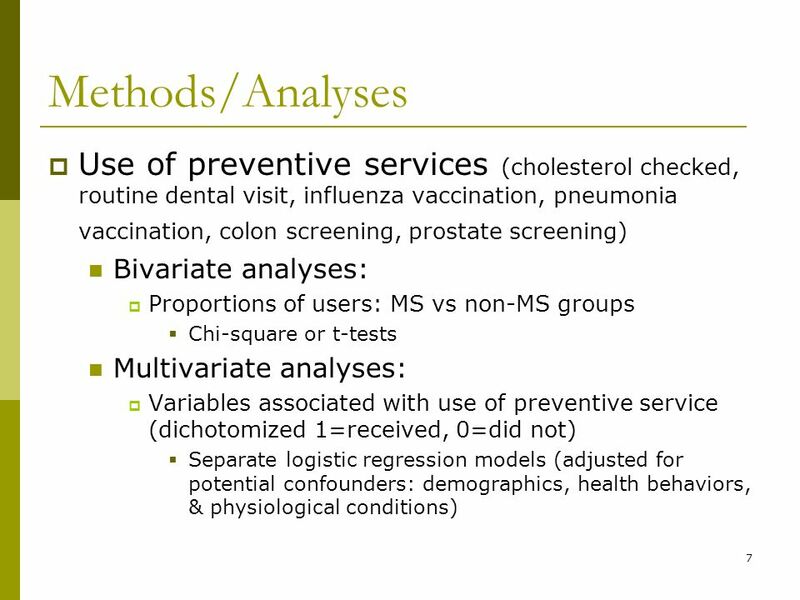 Data may be used to prioritize prevention efforts and to reduce disparities in receipt (to be addressed in future interventions). 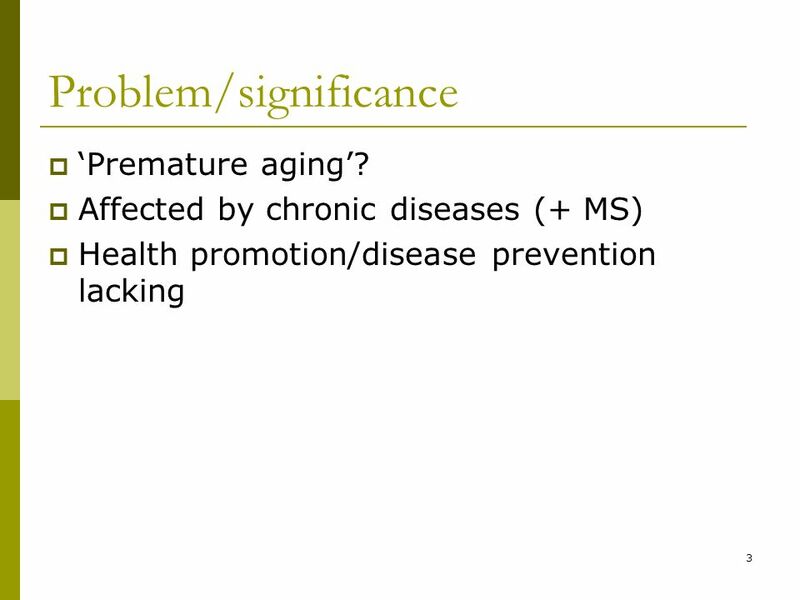 Foundation for a longitudinal study aimed at identifying associations between preventive service use and chronic disease prevalence. 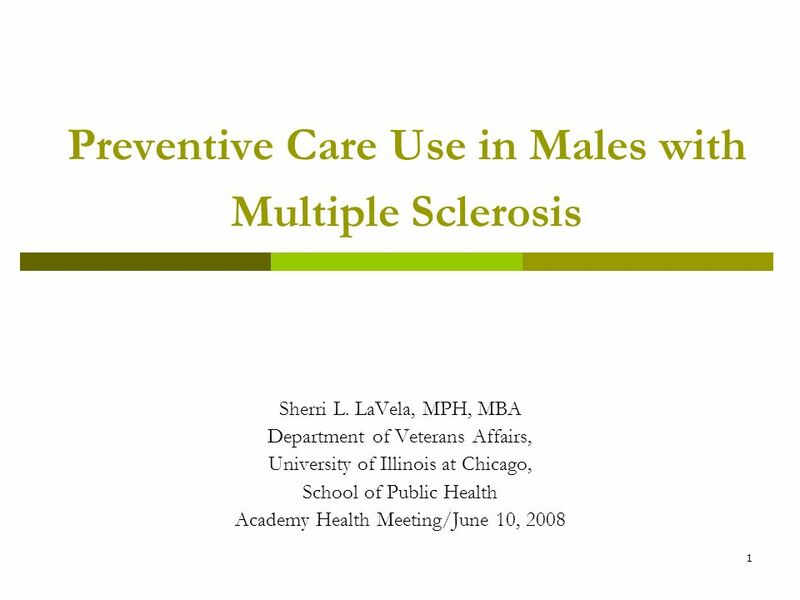 Download ppt "1 Preventive Care Use in Males with Multiple Sclerosis Sherri L. LaVela, MPH, MBA Department of Veterans Affairs, University of Illinois at Chicago, School." 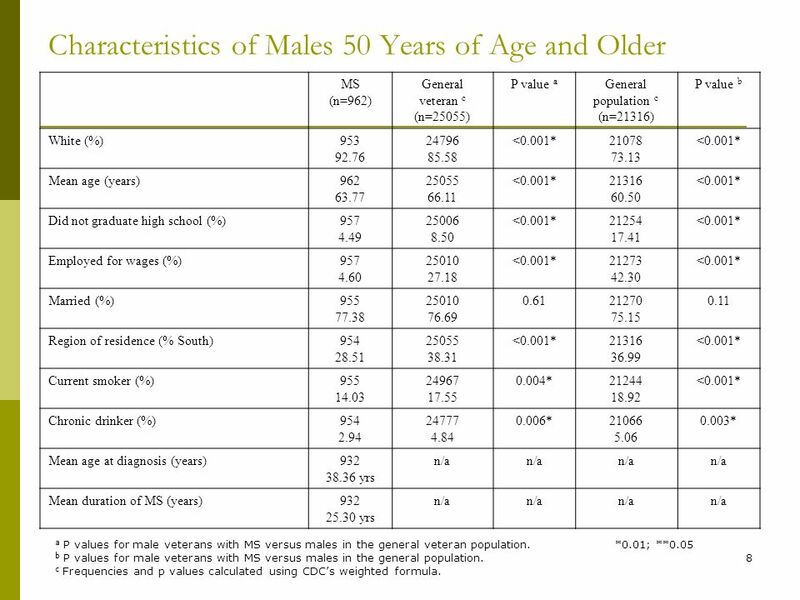 The Burden of Obesity among a National Probability Sample of Veterans Karin Nelson, MD MSHS Assistant Professor Department of Medicine, University of Washington. 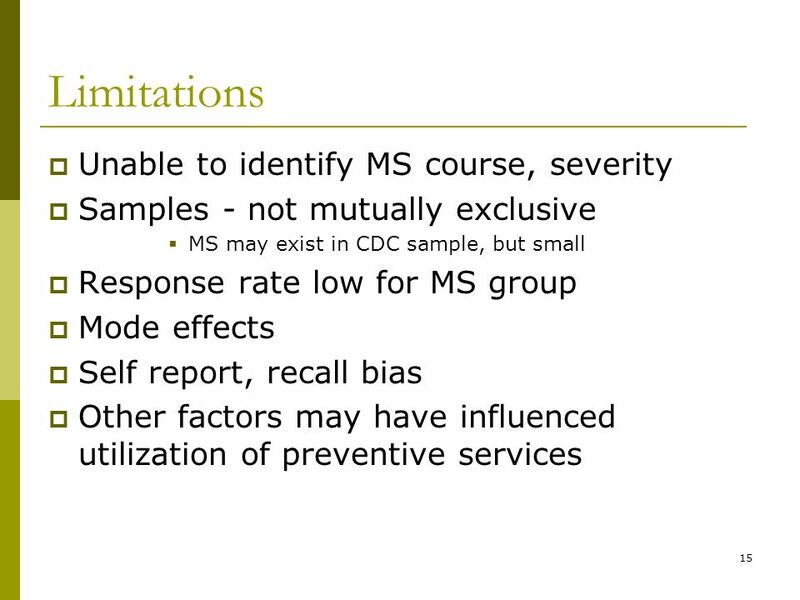 From study objectives to analysis plan Helen Maguire. 1 Somerset County, New Jersey 2011 Community Health Needs Assessment Presentation of the Results Presented By: Lisa McCracken President, Holleran April. 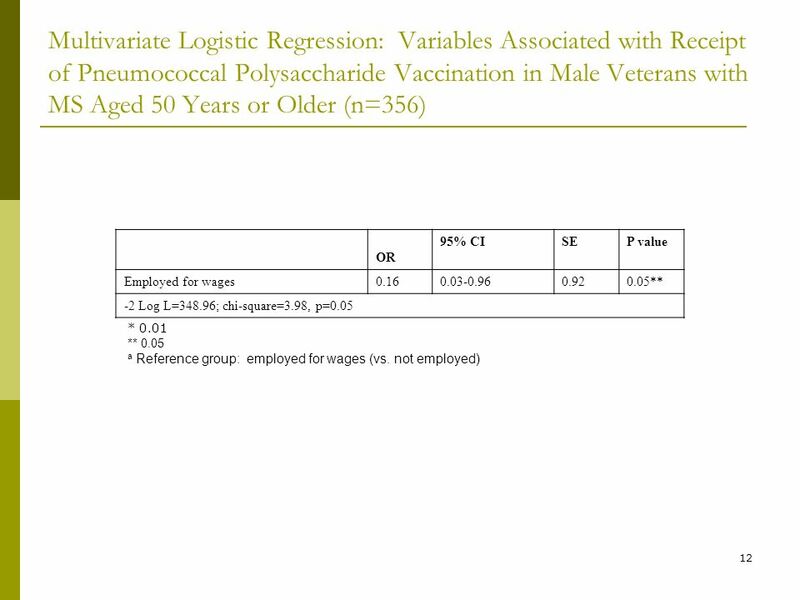 Influenza Vaccination Coverage among Pregnant Women: Results from the Pregnancy Risk Assessment Monitoring System (PRAMS), Rhode Island, Hanna. 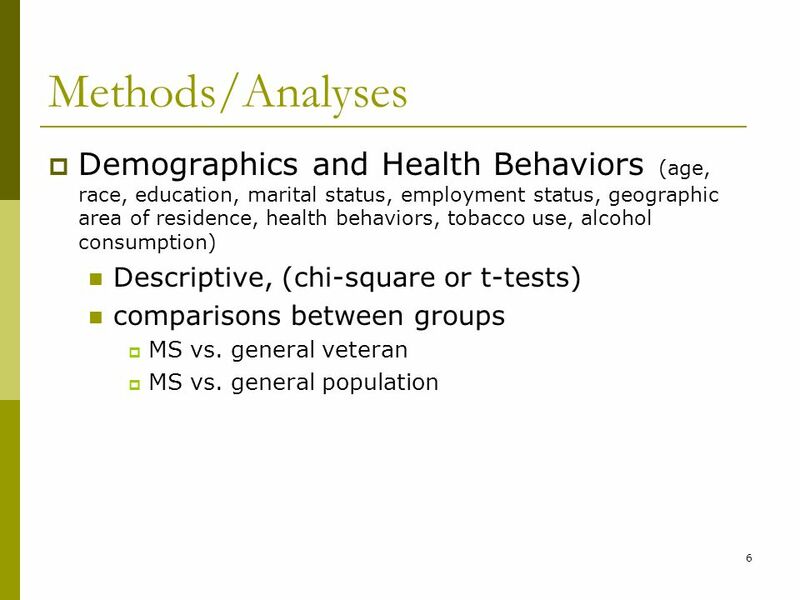 1 Prevalence and Correlates of HIV Risk Behaviors of Inmates in a State Prison System Titilayo Abiona, MD, FMCPH Adedeji Adefuye, MD, MPH, FRIPH Joseph. 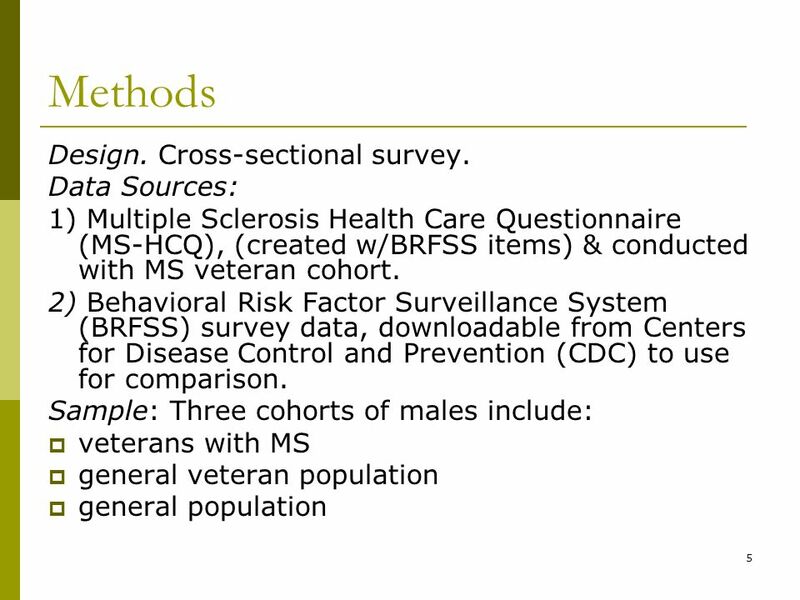 Women’s Health and BRFSS Presented By: Neha Thakkar Arkansas BRFSS Coordinator With the help of: Dr. John Senner Project Officer Arkansas Center for Health. Does Preoperative Hemoglobin Value Predict Postoperative Cardiovascular Complications after Total Joint Arthroplasty? 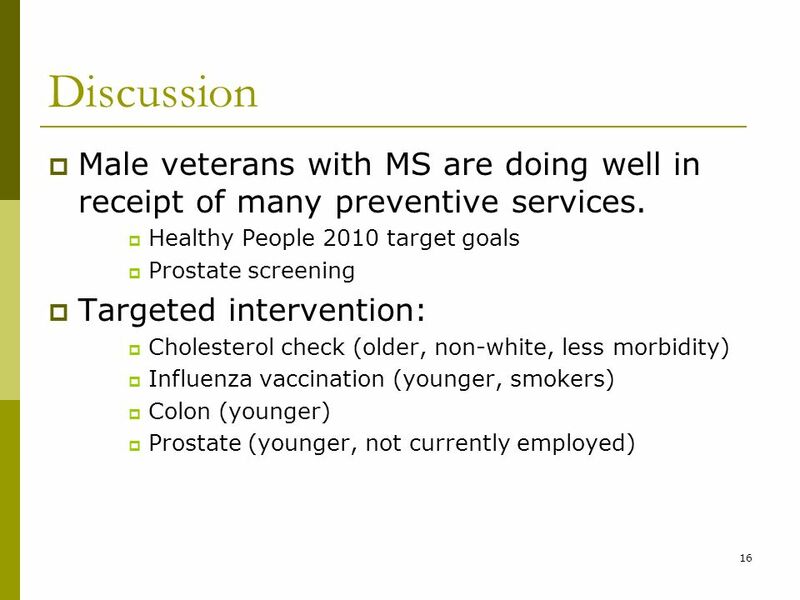 Kishor Gandhi MD, MPH, Eugene Viscusi. 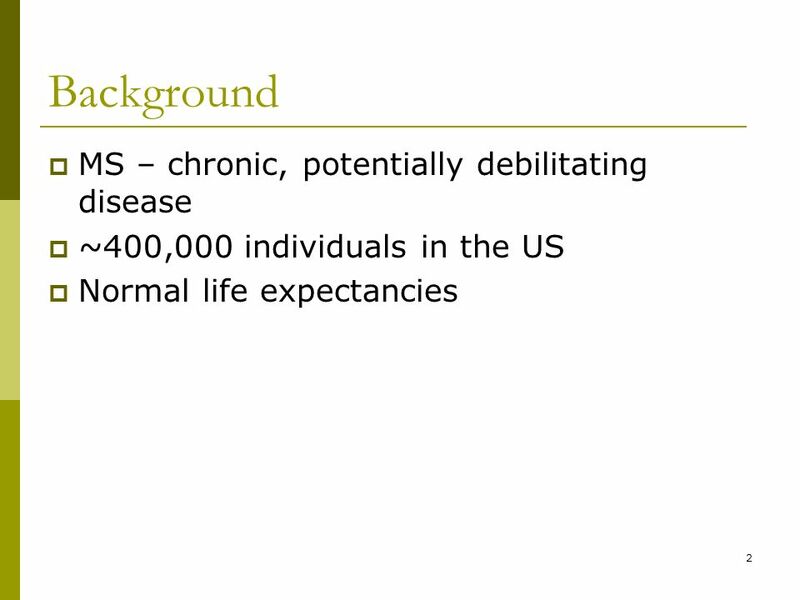 Race/Ethnicity and the Use of Preventive Care Among Adults with Intellectual and Developmental Disabilities. HOME ALONE: DETERMINANTS OF LIVING ALONE AMONG OLDER IMMIGRANTS IN CANADA AND THE U.S. SHARON M. LEE DEPARTMENT OF SOCIOLOGY POPULATION RESEARCH GROUP.